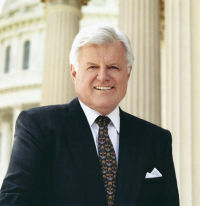 Many members of the Newton Democratic Party have met, worked for, campaigned for or simply admired Senator Kennedy over the years. As one way to celebrate his life and achievements, we are compiling people's personal thoughts and memories about Senator Kennedy. Whether or not you live in Newton, we invite you to share any memories or stories you have of the Senator with the NDCC via the link below. We will compile and post these memories here on the Newton Dems home page. Click here to submit your memory. Please put "tribute" in the subject line so we make sure to receive your thoughts.